We now have a gluten free, Kosher, and organic pita bread. And now offering the Lamb Shank Special - after 4:00 each day. Slices of marinated rotisserie lamb and beef gyro meat, lettuce, tomato, peppers, onions, & tzatziki sauce. 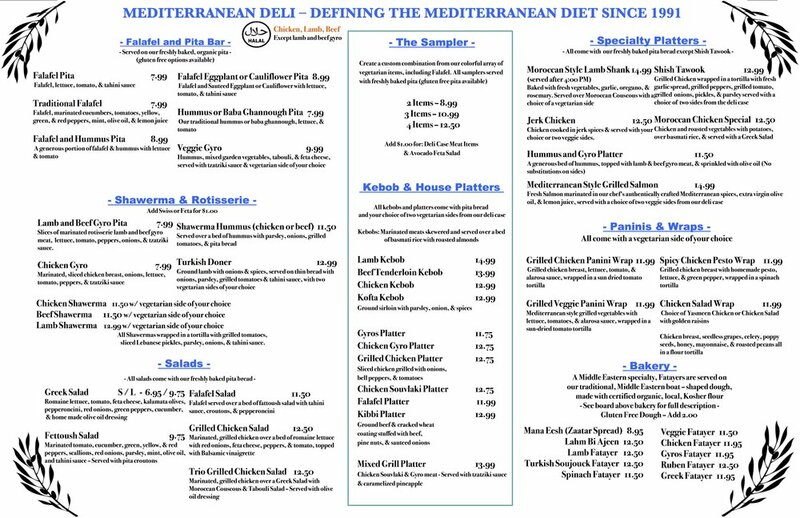 Create a custom combination from our colorful array of vegetarian items (view items in By the Pound), including Falafel. All samplers served with freshly baked pita (gluten free pita available). Please add $1.00 or $2.00 for non-vegetarian items. All kebobs and platters come with pita bread and your choice of two vegetarian items from our deli case (view items in By the Pound). Slices of freshly grilled Lamb and Beef Gyro meat served over a bed of sliced bell peppers, onions, and tomatoes. Chicken shaved off the rotisserie and grilled, served over a bed of sliced bell peppers, onions, and tomatoes. Slices of marinated chicken, grilled to perfection and served over a bed of sliced bell peppers, onions, and tomatoes. Chicken breast marinated in spices and white wine vinegar, skewered, and grilled. Falafel balls prepared with freshly ground chickpeas and spices, fried and plated with tahini. Ground beef, pine nuts, sauteed onions and spices, mixed and coated with ground beef and cracked wheat. Baked with fresh vegetables, garlic, oregano, & rosemary. Served over Moroccan Couscous with a choice of a vegetarian side. Grilled chicken breast, lettuce, tomato, & Alarosa sauce, wrapped in a sun dried tomato tortilla. Grilled chicken breast with homemade pesto, lettuce, & green pepper, wrapped in a spinach tortilla. We have now opened our new bakery which supplies our restaurant with homemade, organic pita. Fresh organic dough topped with a mixture of ground sirloin with onions, tomato, spices, parsley and garlic. Freshly ground lamb mixed with onions, parsley and Middle-Eastern spices. Topped with roasted tomatoes. Aged, spicy Turkish sausage with freshly, oven-baked eggs. Fresh sautéed spinach with scallions and nutmeg, and garnished with roasted tomatoes. Sautéed spinach with grilled, marinated zucchini, squash, red peppers, mushrooms and onions. Fresh chicken breast marinated with specialty spices and topped with grilled Mediterranean veggies. Freshly sliced corned beef topped with swiss cheese, saukraut and homemade thousand Island dressing. Baked on rye bread. Fresh spinach, chopped roma tomatoes, red onions, calamata olives, Greek feta cheese and fresh garlic bakes on our local organic dough. Brushed with olive oil and served with tzaziki sauce. Your choice of pistachio, walnut, date or cheese. Filo dough stuffed with cashews. Shredded whole wheat dough stuffed with honey and pistachios. Semolina dough with a touch of coconut and honey and pistachios. Ferina dough stuffed with rose water and choice of dates or pistachios.